Congress and BJP came together to get legislator Waris Pathan expelled from Assembly. 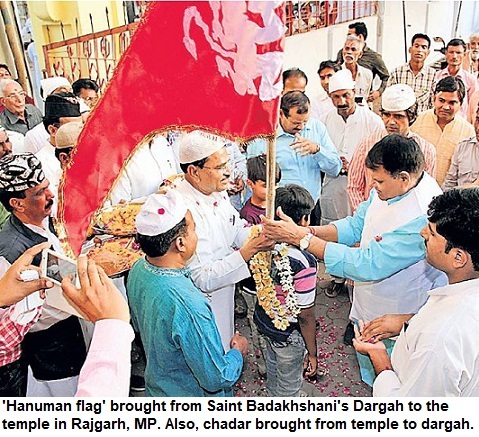 Millions of Muslims including schoolchildren daily chant 'Bharat Mata ki Jai'. 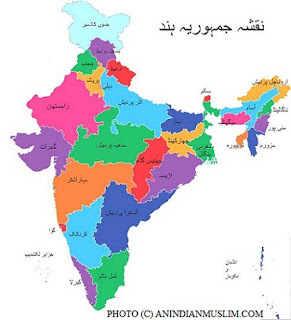 The Majlis-e-Ittehadul Muslimeen [MIM] leader had said that he won't say 'Bharat Mata ki Jai'. But who gives someone a right to decide that they are more patriot and to put others to this patriotism test. How many other countries have such tests for their own country men? Vande Mataram, Bharat Mata ki Jay, and at times, Saraswati Vandana? Both parties are two sides of same coin, no difference. Everyone is free to say, 'Jai Hind', 'Jai Bharat' or 'Hindustan Zindabad'. Great RSS' game. Raise an issue, someone in a huge country will react. If Muslims react its trouble.--they'll be blamed, termed 'less patriot' If don't react, then threshold affected for later, as something of a higher degree will be forced because the precedent is there that earlier it was enforced and none one had any problem. Being silent is no option either because you are pushed to wall further. Today, Bharat Mata. Then, a month later, 'Desh mein rahna hoga, Vande Matram kahna hoga'. A month later it'll be 'Suya Namaskar'. Then, beef issue will be raised. Subsequently, 'bhojan mantra' in angan-wadis, then 'Saraswati Vandana' in school, then Yoga, then Gita lessons in school, then something else. Throughout the year, this continues and the result is Muslims are DEFAMED, this creates image of 'the other, anti-national, bad apples'. Defaming hurts most, it leads to heightened communalism in society, trouble in getting jobs, houses. This defamation and constant attacks, affect Muslims psychologically. It breaks them. It hurts confidence. That's the aim too. RSS projects are on all round, in every sector. Socially, politically, everywhere Muslim has to be targeted, weakened. How to get out of this cycle? RSS, its innumerable arms, branches, have no dearth of ideas and ways to create controversies, keep up this pressure on the community. It’s so easy, for them. Someone may say, 'Bharat mata ki Jai', but coercion is not tolerable. Patriotism test can't be forced on anyone. No one has this right, sorry. Why RSS' Bharat Mata doesn't have national flag in hand? 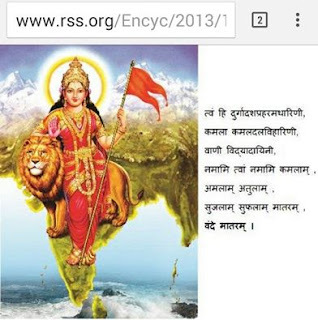 Journalist and former India Today managing editor, Dilip C Mandal, has asked why the Bharat Mata portrayed in photographs on all the RSS websites doesn't have the national flag in her hand? "Why she is holding the Saffron flag? ", he asks in his Facebook posts. Mandal says that this patriotism is suspect as there is no tricolour and the Ashok Chakra is also missing.